Repo watching is an important economic indicator. If repos don't roll over, credit freezes up. It is sort of like looking at a giant glacier, waiting for the big collapse on the edges. You watch and watch and watch, until you are bleary eyed, but then the action happens in a split second. There are a couple of websites that deal with repo watching, including here at Talkmarkets. Jeffrey Snider, contributor to this website, is a serious repo watcher. Looking into how the system works in simple terms can help understand the economic indicator effect of repo rollovers. There are comments below about how Steve Mnuchin fits into this process. Recent developments again highlighted the importance and fragility of funding liquidity. Documents released last month—five years after the Financial Crisis Inquiry Report—substantiatedthe Report’s account of the origins of the March 2008 run on Bear Stearns (then the fifth largest U.S. investment bank). According to the Report, the run began with the efforts of Bear’s clients to “novate” derivatives contracts—that is, to transfer exposure to Bear from one counterparty to another. In normal times, derivatives novation is routine, but (absent perfect multilateral netting) it is not feasible for everyone to escape contractual exposure to a specific counterparty, let alone to do so quickly. And, as the opening quote of this note indicates, as of March 11, 2008, Goldman Sachs no longer wished to accept novations or other contractual assignments from others that would cause it “to face Bear” as a counterparty. The news that one investment bank no longer wished to accept the risk of dealing with Bear spread almost instantly, so that within a few days Bear’s funding dried up completely. Bear Stearns was a highly leveraged fund, relying on borrowing for funding, with a really small rainy day fund. According to Henry Blodget, in a remarkably lightly viewed article on Business Insider, Goldman denied that it refused to back Bear Stearns. Now we know that it is pretty much accepted as fact that Goldman created the funding disaster at Bear. These troubles deepened over the coming weeks, but instead of coming clean, the fund managers reached out to institutional investors seeking more loans. As the housing market continued its downward spiral creditors to the funds became nervous about the value of the underlying assets. They sought additional cash as collateral, in a way that would for an individual investor be akin to a margin call. Meanwhile, the funds themselves were in the red. Less than six months old, the Enhanced Leverage fund was already giving negative returns while the older fund’s record 40-month positive return streak was also broken. The combination of bad paper and lack of capital ultimately destroyed Bear Stearns, requiring a bailout. Ultimately the even larger Lehman Brothers failed as well, with no bailout, and the Great Recession was on. Private banks acting recklessly lead to the Great Recession. Lehman had wanted to become a bank holding company to shore up capital as early as July, 2008, but Geithner said it was a gimmick. That gimmick likely saved Goldman Sachs in September, 2008. Ultimately, counterparties like Goldman Sachs, who feared risk, resulted in a halting of repo rollovers. Rolling over short term debt can mean life or death for the weakest firms and can scare the entire financial system. Was it a greedy conspiracy to take out Lehman Brothers? Could future conspiracies wipe out the financial system? So much for the invisible hand of self interest doing good all the time. But I digress. So, one can easily see that repo watching has become important as a means of detecting when the next credit meltdown could occur. The financial system found out it was only as strong as the weakest links in the Great Recession. We saw what happened when there was too much liquidity in the system. Firms relied on credit, rather than on collateral, and it was said that Lehman was leveraged up 31 times. Many banks in Europe were leveraged up far greater, like Deutche Bank, and that bank is still undercapitalized. When that committee looked at repo markets, it saw periodic volatility in prices and rates, especially in Europe and the United Kingdom, that suggests repos aren’t flowing as readily as they once did. Maybe higher capital requirements, taxes and fees since the financial crisis are making repo unprofitable? Maybe there’s a shortage of collateral?This could be a good sign, showing that excessive leverage in the financial system, which fueled the financial crisis, is coming under control as regulators hope. Or it could be a bad sign, that (1) cash lenders and borrowers will turn to riskier trades to meet their needs, (2) in a crisis traders will not be able to use repos to raise cash and instead will have to sell assets, which can trigger fire sales and contagion and (3) central banks won’t be able to conduct monetary policy with repos as efficiently. The next couple of years, according to the BIS, will determine if this market in transition will get it right or if the wheels will run off the track. The Finadium consultancy believes that the shortage of collateral in the market means that this is more than just a transition, that it is leading to financial disaster. Certainly, the hoarding of bonds tells a lot about the fear in the markets. While other contributors to the committee saw encouraging signs, the committee is aware that Steve Mnunchin, wants the leverage to ramp up once again! 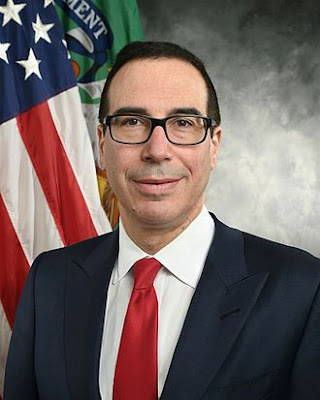 If anyone doubts that the Trump team is looking for another housing bubble to infect the middle class and poor, just follow the Mnuchin. There are some other signs that I wrote about in which a housing bubble could come about under Trump. But bank leverage is the key first step down the path to repo rollover destruction and financial meltdown. I don't always watch repos, but when I do I see the housing bubble looming in the distance. Stay liquid my friends!